Beinn Mhanach lies at the head of Gleann Ach'-innes Chailein overlooking Loch Lyon to the E. It is an uncomplicated mountain orientated E to W with two tops, the second being Beinn a' Chuirn (923m). To the S the slopes are smooth and moderately steep, but there are rocky outcrops on the N slopes. 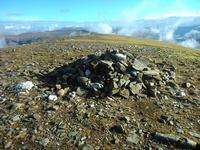 Beinn Mhanach is normally ascended from the track in Srath Tarabhan up the S slopes to the col between Beinn Mhanach and Beinn a' Chuirn. 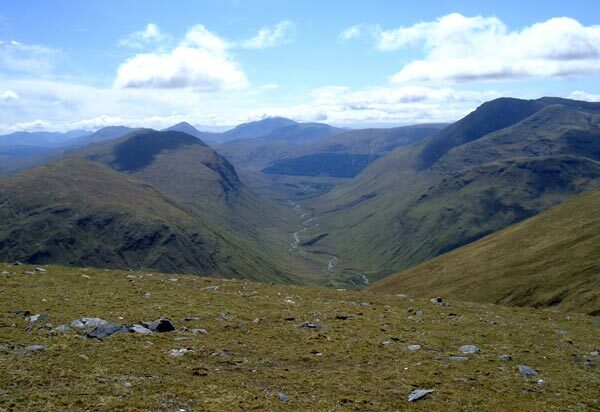 It can also be climbed from Beinn Achaladair or Beinn an Dothaidh to the W, via the bealach at the head of Gleann Calliche again ascending to the same col.
On track heading towards Beinn Mhanach with the viaduct in foreground. 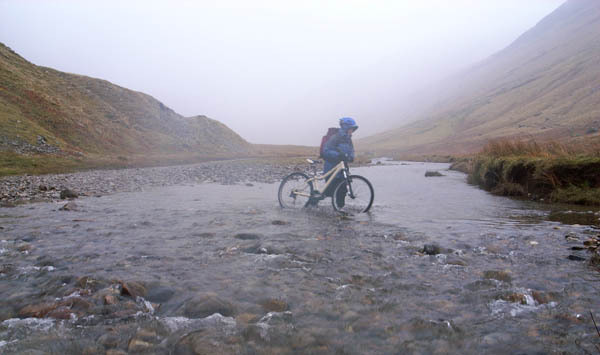 Easter 2007 - Cycling along the Allt Kinglass is no guarantee of keeping your feet dry. There are multiple river crossings, though in a dry spell they are easy enough to hop over. The summary information of one or more ascent routes that include Beinn Mhanach. 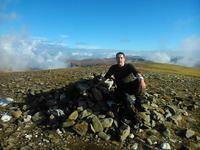 1 918 m 20.94 km 6 hrs Beinn Mhanach Easy climb with long walk in. Biggest problem is the risk of wet feet, although stepping stones are available if river is not in spate. Use of bicycle can be considered, but you will have to cycle through streams! 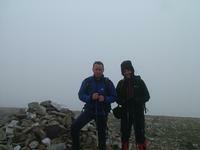 Me & David at the summit his first Munro in 6 years. Joyce at one of the many river crossings. 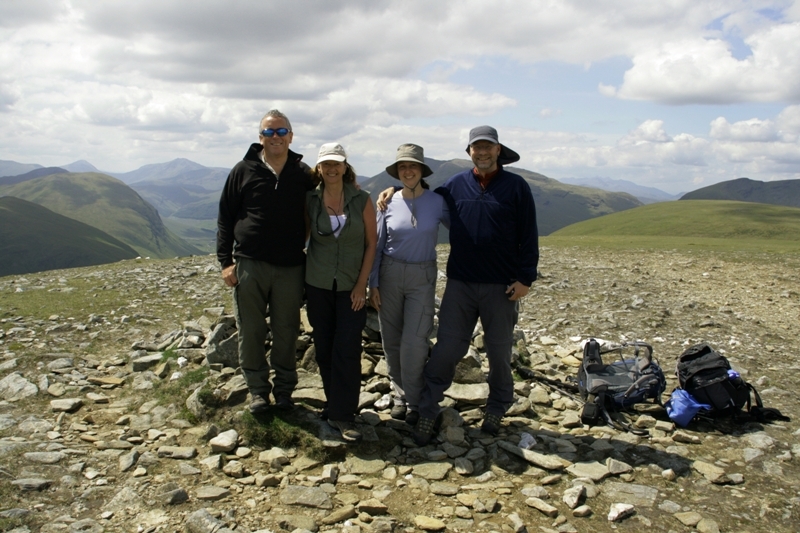 Scott, Lynda, Joanne & Graham on summit of Beinn Mhanach (3rd July 2011) with Beinn Dorain directly behind and Beinn a' Chaisteil (corbett) to left. Great views all around made the hot slog up worthwhile! 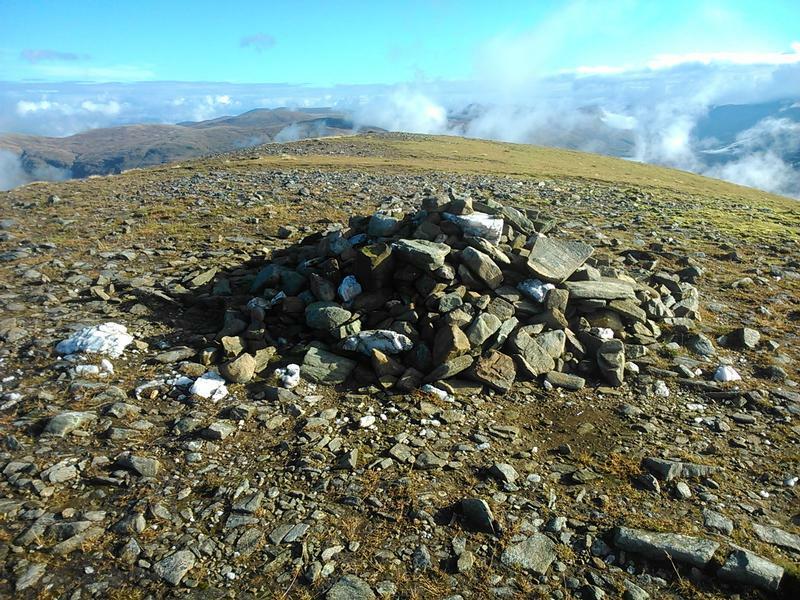 Post a few words about Beinn Mhanach or read what others have had to say. Showing the most recent 5 of 12 comments. Would you like to view all 12? Took the route up Auch Glen. Echo the difficulty in getting parked beside the A82, but there are decent laybys not far away. A bike would have been useful. River crossings would definitely be a problem in wet weather. 'Munro Book' recommended rising traverse up south slopes to col. That was hard work across a succession of gullies. 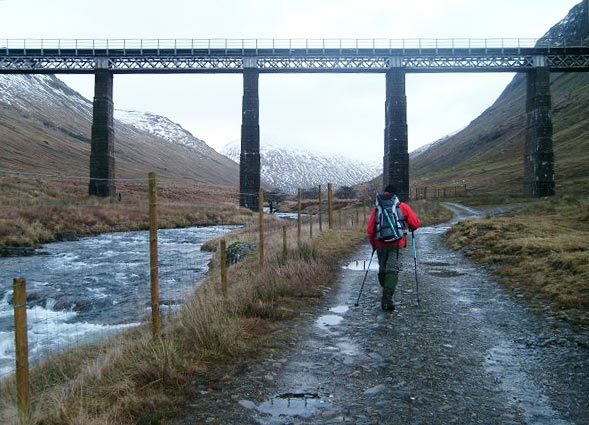 Better, in my view, to stay on the track until the bridge over the prominent burn down opposite the col, then to climb up alongside its east side. Bike up glen from Auch is the way to do it, great fun fording the Kinglass on it several times on the way there and back, at least if it's not in spate, and it will help keep feet dry! The river bottom is stony not silty so its possible to pedal across but best to hit the crossings with sufficient momentum to carry you most of the way from one side to the other if possible. 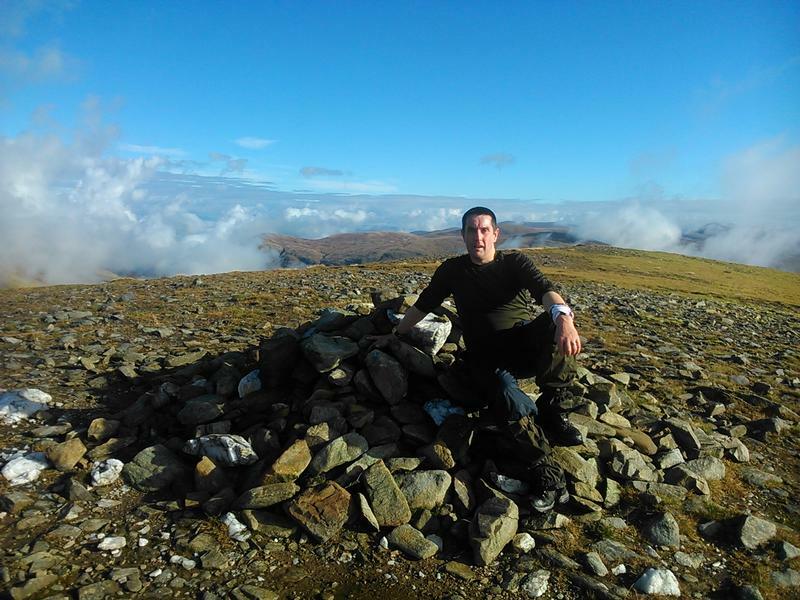 I didn't find the southern slopes so steep or boring to ascend, and provide quick access to the summit once you reach the foot of Mhanach, which only took me 1.5hrs from Bridge of Orchy hotel, at slow cycling pace! Decided to do Beinn Mhachan from Coire nan Clach.This means ascending from Bridge of Orchy.Get to Bealach at the head of Coirean Dothaidh.This is also the start point for Beinn Dorain/Dothaidh.Snow drifting meant there was some tough and treacherous moments along this Glen.I would hate to go along this in wet conditions.It was frozen in the main so the snow trudging was a better exchange.Drop sharply and skirt the south top of Beinn Achaladair and head down the Glen for about a mile before turning East to Beinn a Chuirn.There are some mean looking crags here so best to go on further where you can climb up steep hazard free slopes.There is a path according to the map couldn`t find it due to snow there were no footprints.Just me breaking fresh snow.The joys!.Soon the twin peaks appear giving great views over Loch Lyon Achaladar/Creachain.Headed back for a bit on Alt a Chuirn sinking thigh deep in to fresh snow.Gained the East cragy slope of Beinn Dorain and back to the Bealach. We counted 11 river crossings starting from Auch Farm, multiply that by 2 if you return by the same route. River was in spate even in August. Very wet feet again and again. Take a bike as the ride back is awsome and prepare for wet feet! !